The United States has asked Saudi Arabia’s ambassador to the U.S. to return from a trip home with information on missing writer Jamal Khashoggi. Khashoggi’s disappearance has prompted global demands for answers from Saudi Arabia, with world leaders, including U.S. President Donald Trump, registering their concern. Nauert did not say why the Saudi ambassador, Prince Khalid bin Salman, is returning to Saudi Arabia. Reporters Without Borders says it and two other human rights groups have referred the case of missing Saudi writer Jamal Khashoggi to the United Nations Working Group on Enforced or Involuntary Disappearances. In a communique sent to journalists Thursday, Paris-based RSF called for an independent investigation to establish what happened to Khashoggi. Turkish officials allege he was killed inside a Saudi consulate in Istanbul last week. RSF suggests such a probe could be carried out by the U.N. special rapporteur on Freedom of Expression and the U.N. special rapporteur on Extrajudicial, Summary or Arbitrary Executions, in conjunction with the U.N. working group. Khashoggi wrote columns for The Washington Post, including some critical of Crown Prince Mohammed bin Salman. He had been living in the U.S. in self-imposed exile. A Turkish official says Turkey and Saudi Arabia will form a “joint working group” to look into the disappearance of Saudi writer Jamal Khashoggi. A spokesman for President Recep Tayyip Erdogan (REH’-jehp TY’-ihp UR’-doh-wahn) of Turkey tells the state-run Anadolu Agency that Turkey and Saudi Arabia have agreed to set up the group to jointly “shed light” on the incident. Spokesman Ibrahim Kalin says the proposal to set up the committee was made by Saudi Arabia. President Donald Trump says he’s reluctant to slash weapons sales to Saudi Arabia, saying that if the U.S. doesn’t sell arms to the kingdom, then the Saudis will buy them from Russia or China. Trump visited Saudi Arabia on his first international trip as president and announced $110 billion in proposed arms sales to the country. Some U.S. lawmakers want the U.S. to stop the military sales because of Saudi Arabia’s alleged involvement in the case of a missing Saudi writer who vanished after entering a Saudi consulate in Turkey. Turkish officials allege that Jamal Khashoggi was killed inside the consulate. Some senators are questioning American support for the Saudi military campaign in Yemen as anger intensifies with the kingdom over the disappearance of journalist Jamal Khashoggi. He’s gone missing after entering a Saudi consulate in Turkey. Sen. Chris Murphy is calling for at least a temporary halt in U.S. support for the Saudi-led bombing campaign against Iranian-backed rebels in Yemen. In addition, three Republican and four Democratic senators have written Secretary of State Mike Pompeo raising concerns over last month’s certification that the Saudi-led coalition was taking actions to protect civilians. President Donald Trump says the United States is being “very tough” as it tries to find out what’s happened to a Saudi writer who’s been missing for a week after he went into a Saudi consulate in Turkey. There are fears that Jamal Khashoggi, who’s contributed columns to The Washington Post, has been murdered. 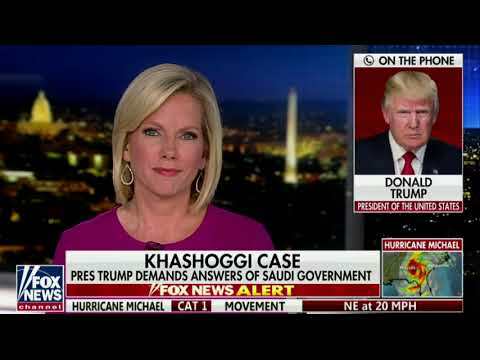 The president tells “Fox & Friends” that Khashoggi “went in and it doesn’t look like he came out” from the consulate. Trump isn’t providing any details on an investigation. There’s been a long history of close U.S.-Saudi relations, and those have intensified under Trump. But they appear in jeopardy by the suggestion of a carefully plotted murder of a Saudi government critic, Jamal Khashoggi. Khashoggi disappeared a week ago after entering a Saudi consulate in Turkey.